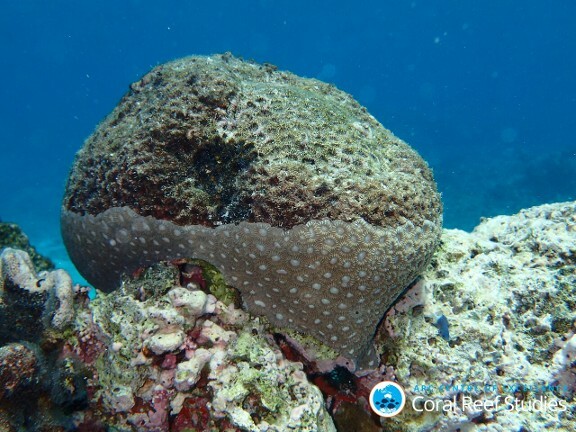 Although researchers agree coral undergo thermal stress when temperatures exceed 1 to 2°C of their local summer maximum, there has been no trend in maximum summer temperature in the northern Great Barrier Reef. In Climate Change and the Great Barrier Reef: A Vulnerability Assessment (2007), Smithers reported on the comparison of mean maximum sea surface temperatures for both the northern and southern Great Barrier Reef (GBR). Since 1903 the average temperature of the southern GBR warmed by 0.7°C and the northern GBR by 0.4°C. But more importantly Smithers reported the mean maximum sea surface temperature between the decades of 1910 to 1919 and 1990 to 1999 showed “a 0.6°C SST rise on the southern GBR but no change in the northern GBR”. So, without a long-term trend of increasing maximum temperatures, climate change, whether natural or anthropogenic, did not contribute to the region’s thermal stress or promote bleaching. The southern GBR experienced the least bleaching despite a century of warming and contrasts with the northern sector’s severe bleaching and high mortality where maximum temperatures remained unchanged. This paradox contradicts Hughes’ global warming attribution. But Hughes 2017 dismissed this contradiction by creating a false dichotomy between weather and climate stating, “Arguably, southern reefs of the Great Barrier Reef would also have bleached in 2016 if wind, cloud cover and rain from ex-tropical cyclone Winston had not rescued them.” In other words, Hughes blamed the lack of bleaching in the south on weather, but the extreme bleaching in the north on global warming. But it was weather that caused the northern GBR’s extreme bleaching. Researchers also calculated that during the global warming hiatus years between 1998 and 2013, coastal regions of the Great Barrier Reef experienced a short-term cooling trend illustrated below in Figure 1. That coastal cooling trend further contradicts Hughes’ assertion that “rising sea surface temperatures owing to global warming have triggered unprecedented mass bleaching of corals, including three pan-tropical events in 1998, 2010 and 2015/16”. The severe 2016 bleaching was not due to a rising temperature trend. New research details the chain of weather events that more parsimoniously explain the extreme 2016 bleaching. 1) An atmospheric hot spot over the Gulf of Carpentaria in the far north of Australia increased solar heating of its shallow waters that were made more shallow by anomalous drops in sea level (Wolanski 2017, Duke 2017). 2) In contrast to the normal westward flow of cooler Coral Sea waters across the Torres Strait into the Gulf of Carpentaria, winds forced anomalously high sea levels on the west side of the Torres Strait pushing heated Gulf of Carpentaria waters toward the anomalously low sea level on the strait’s eastern side and then onto the northern GBR. This is described in detail in The Gulf of Carpentaria Heated Torres Strait and The Northern Great Barrier Reef During the 2016 Mass Coral Bleaching Event (Wolanski 2017). 3) The small but significant sea level gradient across the Torres Strait generated a very slow flowing current so the water experienced a lengthy residence time in the shallower Torres Strait (only 5-20 meters deep) where solar heating further amplified water temperatures (Wolanski 2017). 4) In addition, regional falling sea levels coupled with extreme low tides during midday throughout the GBR further amplified water temperatures and exposed coral to hot air temperatures (Steele 2017). Hughes 2017 selectively connected the dots for GBR bleaching events from 1998 to 2002 to 2016 to suggest increasing greenhouse gases were driving increased bleaching. An alternative explanation suggests that random locations of natural hot spots or Hot Events were responsible for variations of each bleaching event. As seen in Figure 1 below (from Liu 2003), although the 1998 hot spot was far more intense in terms of Degree Heat Weeks, the center of the hot spot was located to the south of the GBR, resulting in less bleaching. In contrast a weaker 2002 hot spot caused greater bleaching because it was centered over the central GBR. Due to differing hot spot locations, 42% of the GBR reefs bleached in 1998 compared to 54% in 2002 (Berkelmans 2004). And unlike 1998 and 2002, a 2016 hot event occurred in the north over the Gulf of Carpentaria triggering extreme bleaching across the northern GBR. Counter-intuitively rising air currents from tropical convection generates hot spots where temperatures exceed 30°C hundreds to thousands of kilometers away. To maintain mass balance rising convection currents are balanced by downward air currents elsewhere, and those subsiding currents are dry, lead to less clouds and increased solar heating as well as reduced winds and less evaporative cooling. Relative to these natural dynamics, any immediate contribution from CO2 back radiation is insignificant. Due the reduced evaporative cooling and increased solar heating during a hot event, millions of square kilometers gain over 60 Watts/m2 raising surface temperatures above 30°C (Qin 2009). In contrast CO2 back radiation theoretically contributes no more than 1% of the energy to any given tropical heat event. Researchers suggest the imbalance in the earth’s energy budget due to increased levels of CO2, globally amounts to 0.6 +/- 0.4 Watts/m2. However regionally, in the tropics any added CO2 has minimal impact. As the IPCC points out, “In the humid equatorial regions, where there is so much water vapour in the air that the greenhouse effect is [already] very large, adding a small additional amount of CO2 or water vapour has only a small direct impact on downward infrared radiation.” Furthermore, researchers suggest that over 90% of that energy is stored in the ocean; but at depths that do not affect coral bleaching. Consistent with earlier studies, Cheng 2015 determined sea surfaces down to 100 meters depth have cooled since the turn of the century. And although Hughes 2017 fears future increases in greenhouse gases and global warming will extirpate most corals, rising CO2 will have a diminishing impact. For example, in “Human Impacts On Weather And Climate” by Cotton and Pielke (2007) the heating effect of increasing CO2 concentrations from 360 ppm to 560 ppm was calculated to be just 0.09 Watts per meter squared in the tropics. So with minimal added energy from 560 ppm, CO2 will still contribute no more than 1% to any given natural hot event. Varying locations of hot events are determined by varying locations of remote convection. As satellites have observed, tropical oceans are a mosaic of regions with rising convection currents adjacent to regions of subsiding air currents and hot spots. For example, the self-regulating Madden-Julian Oscillation (illustrated below) shifts convection and cooling regions in tandem with subsiding air and hot spots across the Indian Ocean and western equatorial Pacific every 30 to 60 days. On greater time scales, El Nino/La NIna events similarly force changes in cool and hot regions. 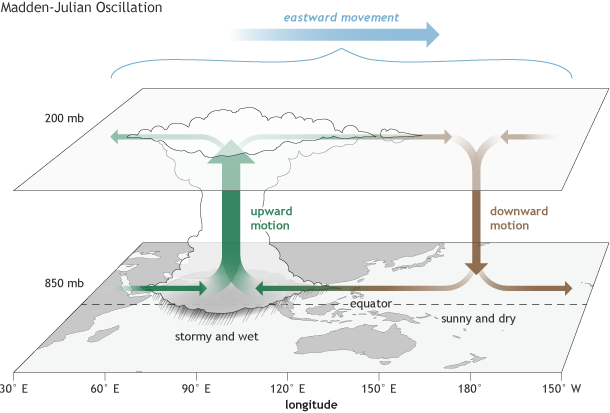 As illustrated below, during La Nina-years the center of intense upward convection and heavy rainfall is centered north of Australia over the Indonesian archipelago. Simultaneously dry warm zones of subsiding air are centered over the eastern Pacific and eastern Africa. In contrast, during an El Nino event warm water stored in the Indo-Pacific Warm Pool sloshes eastward moving the center of high convection to the central Pacific which simultaneously relocates regions of dry subsiding air and more frequent hot events to the northern Australia/Indonesia region and northern South America. Although export of warm water during an El Nino results in cooler than average water temperatures in the Coral Triangle, subsiding air currents in that region result in hot spots due to greater solar heating and less evaporative cooling. 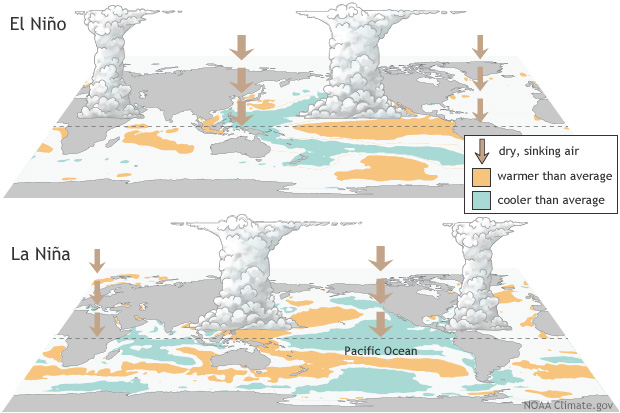 Simultaneously warm waters transported to the cooler central and eastern Pacific regions can directly raise water temperatures causing bleaching in those regions. The combination of warming dynamics is why EL Nino events induce so-called “global” bleaching events even when independent of global warming. Nonetheless, even in non-EL Nino years, random hot events will cause regional bleaching episodes. Falling regional sea levels and low tides amplify heat events. Basic physics dictates that smaller volumes of water heat up much faster than larger volumes. As discussed in the article, Falling Sea Level: The Critical Factor in 2016 Great Barrier Reef Bleaching! regional sea level around the GBR has been falling since 2010 and an El Nino event further reduces those anomalously low sea levels. In addition extreme low tides occurred during midday precisely when Hughes’s bleaching surveys were carried out, and low sea levels amplified the heating of the Gulf of Carpentaria which also caused massive mangrove die-offs (reported here and here). Oddly Hughes 2017 not only ignored this factor completely, he dismissed it in emails to unscrupulous bloggers such as Miriam Obrien (aka Slandering Sou) and Graham Readfearn who attacked the article Falling Sea Level: The Critical Factor in 2016 Great Barrier Reef Bleaching! Those bloggers created another false dichotomy, this time between the effects of low sea levels and high temperatures. For example, Readfearn falsely stated, “Steele’s claim that rather than heat stress, the bleaching could be caused by falling sea levels.” They simply failed to grasp basic physics: lower sea levels amplify temperatures, as well as exposing coral to deadly warm air temperatures and increased solar radiation. Nonetheless Hughes supported their false dichotomy, failed to correct their misunderstanding and argued lower sea level would only affect the upper 15 mm of coral tips. In an interview with YaleEnvironment 360, Hughes pushed coral gloom and doom suggesting widespread bleaching made recovery extremely difficult. By focusing on an anecdotal observation of bleaching at 40 meters depth, he correctly but misleadingly argued unbleached species living at 40 meters depth and below are different from species nearer the surface, and thus cannot aid in the recovery of shallower bleached species. But this is why the lack of depth measurements is so critical. Hughes failed to report that bleaching is most often relegated to the shallowest regions, and that bleaching in shallow waters is often relegated to the upper surfaces of a colony. As shown below “mound corals” photographed around Lizard Island, where bleaching and mortality was quite extreme, only bleached on the upper halves. The bottom, shaded half of the colony still serves as a “refuge” providing new larvae to support rapid reef recovery. Unlike many “mound” corals where the individual polyps are relatively independent and partial mortality is more common, the branching corals in the genus Acropora have polyps that are more interconnected, so that injury to the upper colony often results in the death of an entire colony. Acropora species are fast growing weedy species that evolved during the last 2 million years to cope with rapid sea level change forced by alternating glacial and interglacial periods. They evolved fast growth at the expense of energy storage. As photographed below, the rapid colonization by Acropora coral results in dense thickets in the shallowest waters that are most vulnerable to bleaching and those bleached thickets are often highlighted in the media to dramatize a bleaching event. Unlike Hughes 2017, other studies have more rigorously examined the effect of depth on bleaching. Bridges 2014 observed “coral mortality following a severe bleaching event [in 2010] had diminished sharply with depth. Bleaching-induced mortality of Acropora was approximately 90% at 0-2 m, 60% at 3-4 m, yet at 6-8 m there was negligible mortality. Importantly, at least two-thirds of the shallow-water (2-3 m) Acropora assemblage had a depth range that straddled the transition from high to low mortality.” Although the likelihood of a strong recovery is at least in part dependent on the depth of bleaching induced mortality, Hughes 2017 failed to report on any variations in mortality at shallow depths. It is especially interesting that scientists in the 1929 scientific expedition attributed bleached dead coral to the effects of low tide. 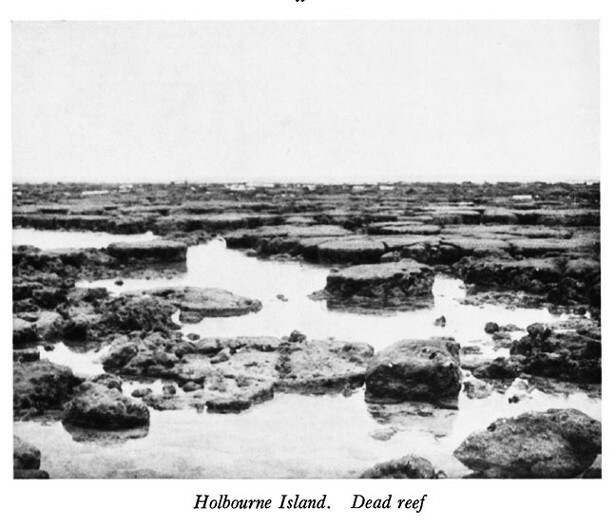 Yonge wrote, “The corals are favoured by the fact that in the summer good low tides occur only at nights, but even during the poor day low tides in February the reef flat on Low Isles was covered with the whitened skeletons of dead corals. Though they had been exposed for only a very short time, yet the extremely high temperature, rising frequently above 35 °C, quickly killed them.” So we must question why Hughes persists in dismissing the effect of low sea level and lower tides that amplify temperatures and cause widespread mortality, in contrast to these earlier observations. In the past researchers like Hoegh-Guldberg and Hughes have argued that widespread bleaching events were rare before he 1980s based on the lack of bleaching reports in the scientific literature. But the scientific literature suffers from several observational biases. For example, although there has been increased attention to coral reefs, increased tourism, and increased aerial surveys since 1980, there is still a lack of observed bleaching in the warm pool regions where temperature models predict bleaching should occur. This contradiction was explained as a function of island remoteness that limits observation. Likewise based on those extremely high temperatures reported by the 1929 expedition, we should expect more reports of early 20th century bleaching. But surveys in the early 1900s were rare. It was native “sea cucumber” fisherman of the GBR who were most likely to observe widespread bleaching. but they were the least likely to report it, especially due to the lack of scientific journals in their native language. Furthermore, due to the prevalence of many dead reefs, most early observers of the GBR were unlikely to see a bleaching event as unexpected or worth reporting. They were more likely to see dead reefs as just another source of limestone for cement and soil amendments. As reported by 1930s geographers, those who were mapping the GBR in the early 1900s, were largely mapping it so others could avoid the reefs and prevent shipwrecks. Reports by the Commissioner of Fisheries for Queensland, William Saville-Kent, provided rare observations of early reef conditions pre-1900. Pertinent to sea level and bleaching today, he reported being puzzled by an observation of a healthy reef immediately adjacent to a dead reef. However, he finally determined the death of that reef was caused by its higher elevation and greater exposure to extreme low tides. Similarly, researchers have determined that about 25% of the Great Barrier’s 3000 coral reefs can be classified as “senile”, meaning they have reached average sea level and have no room to continue growing vertically. Senile reefs are most vulnerable to sea level drops that can result in mortality from heat, cold or excessive freshwater. As researchers reported in 1937, “Some [reefs] are uncovered at half tide, others at low water, others again soon after high water. Still others are always submerged." So it would be of great scientific value if, at the very least, Hughes classified bleached reefs as submerged or exposed during low tide. Despite the lack of pre-1980 bleaching observations, fossil reconstructions of past coral mortality events are informative. Although paleodata cannot identify mild bleaching events because coral can swiftly recover in a month or two, large scale mortality events can be identified. Yu (2012) reported that two reefs in the South China sea often experienced separate local mortality events that are likely explained by local factors or the random locations of hot spots. In association with a more positive Pacific Decadal Oscillation or an El Nino, Yu uncovered simultaneous mortality events on both reefs in 1869–1873, 1917–1920, 1957–1961, 1971, 1982–1983 and 1999–2000 AD. Such widespread mortality over the past 2 centuries is again independent of changing CO2 concentrations or global warming, suggesting widespread coral bleaching has not been limited to the past 4 decades and has been driven by natural ocean oscillations. Finally, Hughes 2017 argues that if reefs have repeatedly bleached, it means coral are not adapting. But such an argument is wrong for so many reasons. First reefs consist of several colonies of several coral species. One species in a reef may bleach one year, and then resist bleaching in the next hot event. On that same reef, another species may bleach in that second event, so that the “reef” has bleached twice, even though some species have developed resistance. Measuring the frequency of bleaching on a “reef”, instead of examining bleaching at a species level, is simply bad science that tells us nothing about coral species ability to evolve less sensitivity to a hot event. In contrast to Hughes 2017, increasing resilience has been reported by other researchers who do examine bleaching on a species level. Furthermore researchers must examine how each species has shifted and shuffled its symbiotic algae as discussed in the article The Coral Bleaching Debate: Is Bleaching the Legacy of a Marvelous Adaptation Mechanism or A Prelude to Extirpation. As detailed in that article, researchers such as Boulotte 2016 have documented that after 2 bleaching episodes in 2 years, coral colonies increased the percentage of symbiotic algae that were more resistant to warm water bleaching. More recent studies have shown that even the most vulnerable Acropora species that Hughes classifies with the climate change “losers”, are now reported elsewhere as gaining resistance to bleaching. Curiouser and curiouser, even the thesis of a pHd student supervised by Hughes, reported that the coral species studied had evolved greater resistance to bleaching throughout recurring bleaching events. Ecologists are trained to examine all the known factors that contribute to the complexity of an ecosystem. Ecologists know they should never blame any single factor for a major change in a biological community. Unfortunately, Hughes 2017 serves as an example of how an overzealous readiness to blame a single factor like greenhouse gases and global warming for coral bleaching can lead to very bad science. This has resulted in widespread gloom and doom such that the most gullible citizens now believe the Great Barrier Reef is dead due to global warming, or that it will be by 2030. We trust science because we believe all the factors leading to a scientific conclusion have been thoroughly vetted. But here that trust has been betrayed as the conclusions of Hughes 2017 were not thoroughly vetted. And when public realizes the Great Barrier Reef has not died, the bad science of Hughes 2017 can only lead to a further erosion of the public’s trust in science and an undeserved and increasing distrust for more diligent ecologists.